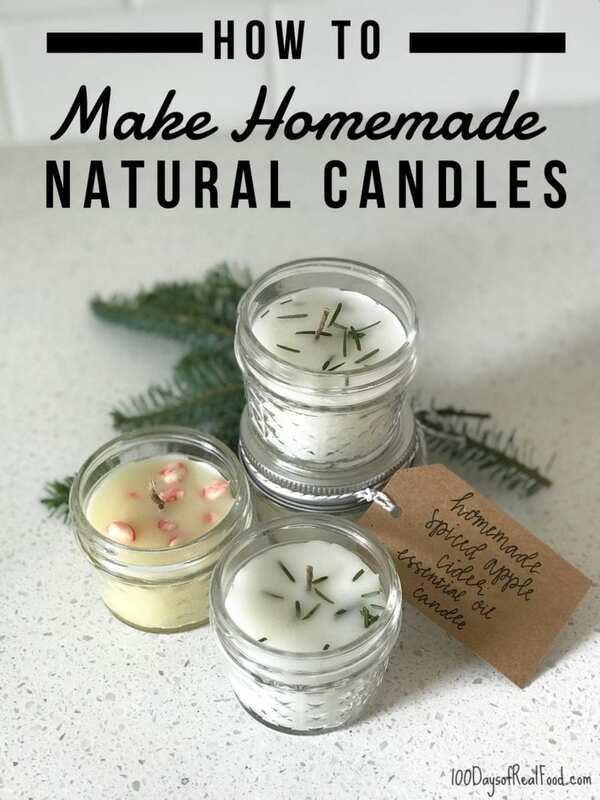 Making your own candles is so much fun and a great project to do with any big kiddos in your life! 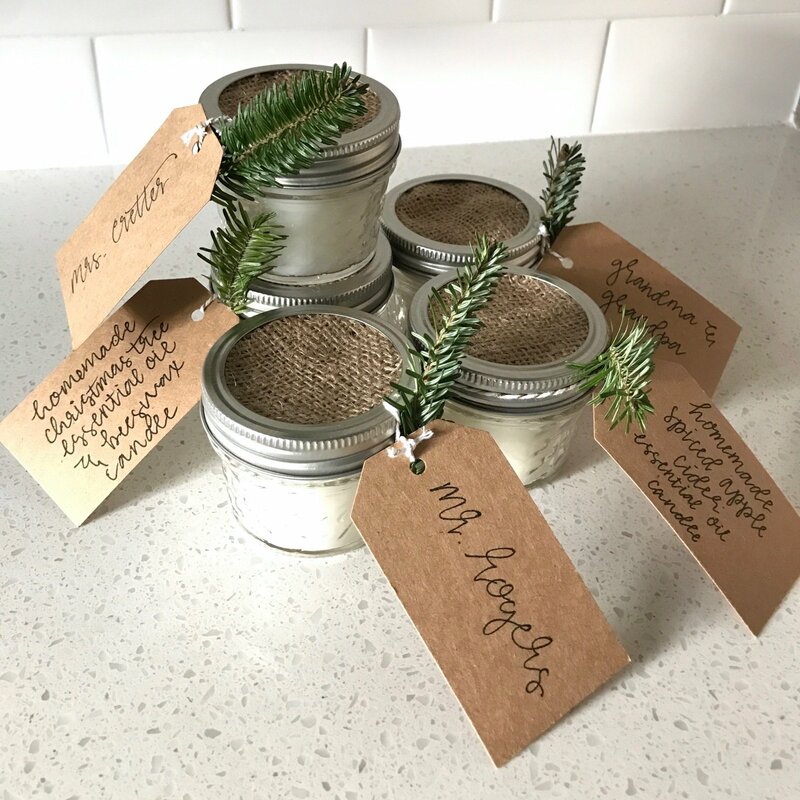 Last year we loved making homemade bath bombs together for our holiday gifts—they were great for teachers, friends, party hosts, the mail carrier, you name it. 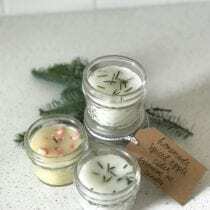 This year, we thought we’d switch it up with high-quality candles made from all-natural beeswax and holiday-scented essential oils from our sponsor Plant Therapy. Before we dive in though, I have to tell you why I despise conventional scented candles. Don’t get me wrong, I love burning candles—it’s hard to beat that ambiance this time of year—and it’s certainly nice to add a pleasant aroma to the room while enjoying one. BUT, breathing in those synthetic fragrances—not to mention the paraffin wax they’re usually made with—can be toxic! Some even say it’s as bad for you as second-hand smoke or the fumes from your car. 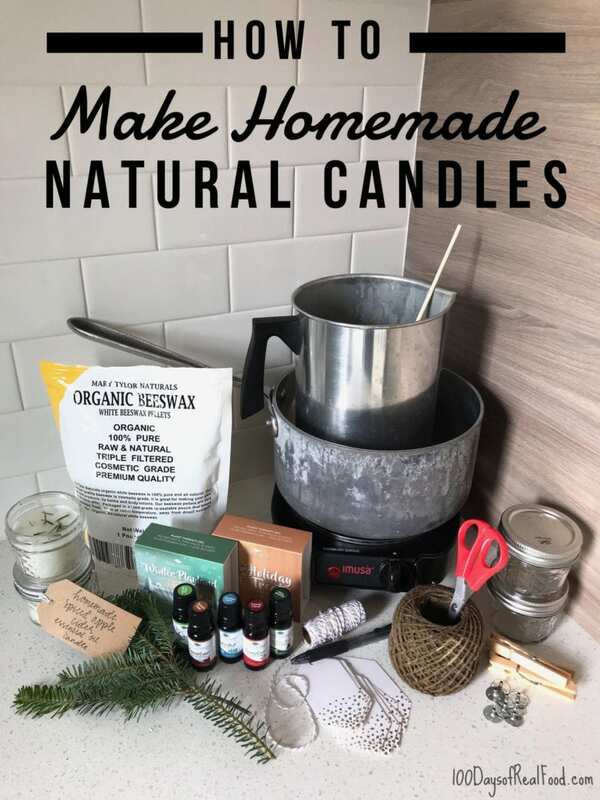 According to the Environmental Protection Agency, along with researchers at the University of Michigan and South Carolina State, certain types of candles have been found to discharge the dangerous chemicals benzene and ketones, both known cancer-causing agents. Synthetic and artificial ingredients are the #1 additive I try to avoid in my food and, naturally (pun intended, LOL), this extends to other products in my life. 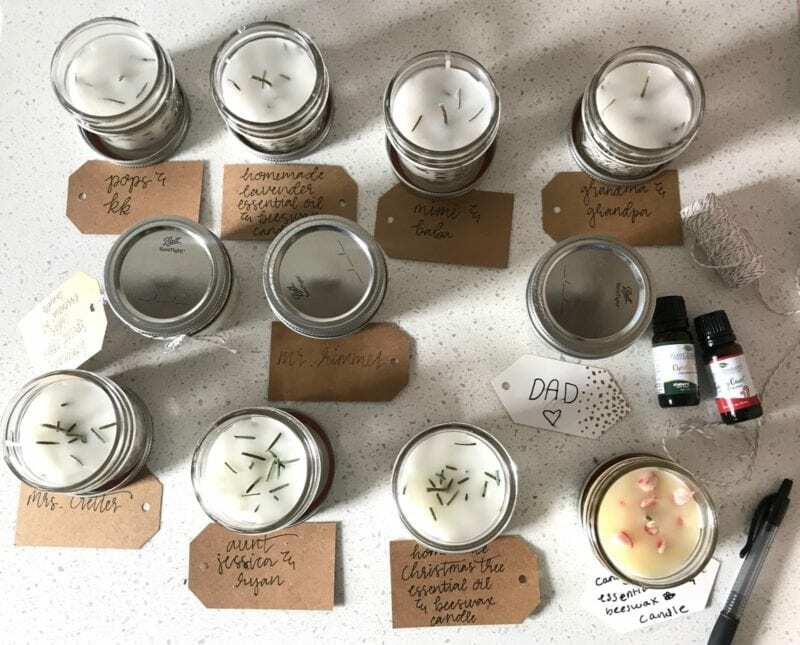 So, rather than emit questionable fumes into my home while burning candles, we thought we’d make (and share) our own DIY natural candles with beeswax and essential oils! Thankfully, not wanting artificial fragrances in our candles doesn’t mean we have to go the unscented route. 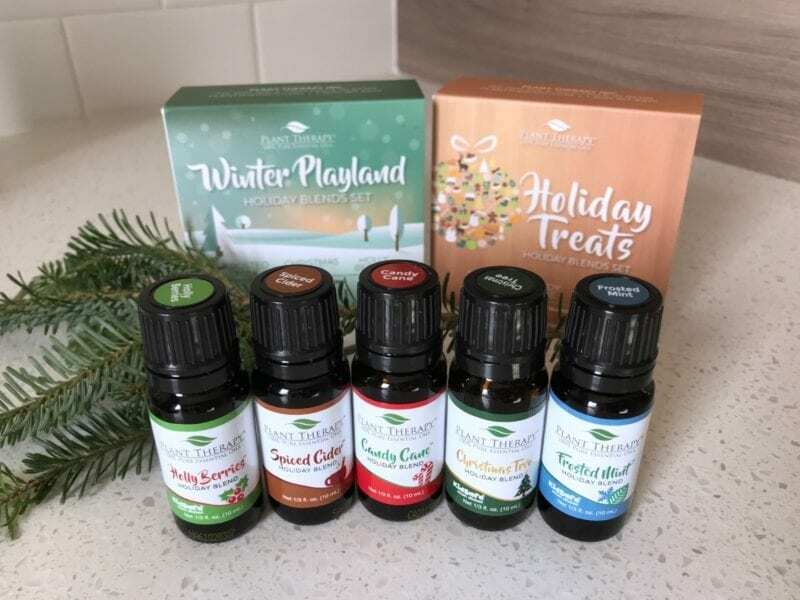 Essential oils have been around for centuries and we thought the fun holiday scents from our sponsor Plant Therapy would be perfect for this project. This Cozy for Christmas Holiday Blend Set would be perfect for making some holiday-themed candles! Essential oils are concentrated, volatile, aromatic liquids obtained from the fruits, seeds, flowers, bark, stems, roots, leaves or other parts of plants. Plant Therapy offers only 100% pure essential oils and is one of the few companies who offer USDA Certified Organic options. All of their oils go through multiple rounds of testing and are always free from additives, adulterants, and dilutions to uphold the highest quality. While you can certainly find many essential oil options out there, know that they are not all made the same. Finding a quality product is essential, which is why Plant Therapy has been a longtime partner of ours! As a bonus, new customers can take 10% off of their first order when you use our code 100DAYS10. A great time to try Plant Therapy! I highly recommend you read this full list of SAFETY TIPS before getting started. Melting wax for candles is really simple to do, but it’s never a bad idea to take extra precautions. Also, make sure you understand why using your gas stove (or expensive pots) isn’t such a great idea for this project! 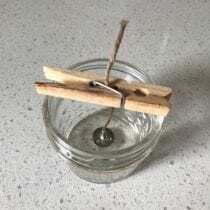 Thread each wick through a wick sustainer tab (twist it around or tie a knot where it comes out at the bottom), place in the bottom of a jar, and temporarily hold in place with a clothespin or by wrapping it around a pencil that lays across the top of the jar. Repeat for all six jars and set aside. Heat the beeswax in a candle-making pitcher on a double boiler over medium heat (electric stove recommended, see above) until completely melted, 10 to 15 minutes. Use a wooden skewer to stir in your essential oil of choice. 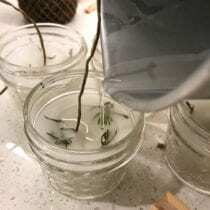 Carefully pour almost all the wax into the jars (leaving some behind in the pitcher) and adjust the placement of the wicks if necessary. As the wax begins to solidify, embed any organic items near the top (if desired). Once the wax completely hardens it may sink around the wick. Simply reheat remaining wax and fill in the gap (adding additional embed items if desired). I think it looks better if you fill beyond the gap, all the way to the edges, for one smooth surface. Let cool till it hardens, trim wick, and it's ready to gift or use! The number of candles this recipe will make is approximate. It will depend on the size of your containers. I love how cute my 6th grader finished these off for everyone on her list! :) And a big thanks to my talented niece for writing all the pretty cards for us. Previous Post: « The Only Oatmeal Cookies I’ve Ever Liked! I had no idea about candles giving off bad fumes! Scary! Are Soy candles any better? Or are there any commercial kinds that are okay? Soy can be better, but often it’s not pure. How many drops of essential oil did you add? Obviously would adjust if I’m making a different number of candles but just looking for a ballpark. Thanks! If you’d rather measure out in drops it’s about 150. Can you please tell me what’s in the Spiced Apple Cider candle. I would love to make it, but would love to know what exactly you put in yours! That is a great idea with the cinnamon sticks. Do you know what type of oils did she use to make is the “spiced apple”? Devon, it was the Spiced Cider scent from Plant Therapy Essential Oils. How would you feel about doing a how to video of yourself making the candles? I think seeing it done would be festive and fun and give me more confidence that I can do this. I would love watching the extra ideas you throw out like you do when you make lunches. Sheila, this is a wonderful idea. Thank you for the suggestion! We’ll see what we can do for the future. Hi! I just want to clarify…do you put the tablespoon of essential oil in the large pitcher or in the individual candle jars? I’m thinking the pitcher, correct? So one tablesooon of essential oil makes 6 candles? Or is it a tablespoon in each candle jar? if you want to use a different scent do you just do another batch? I’m just kind of confused how you made different scents in one batch. I’m sorry…I am not very good with crafts but really want to give this one a try. Thank you so much!